All those who desire to take a view of the splendid surroundings; Ahsan Mount Resort is the place to be. Rendering convenient location, impeccable service and warm hospitality, it is one of the recommended hotels in Sonamarg. 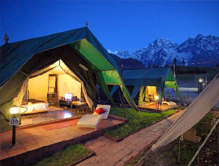 It is one of the best deluxe hotels in Kashmir. The resort offers much more than one could imagine so that the guests don’t feel short of anything during their stay at Ahsan Mount Resort. Situated in proximity to the must see attractions of the beautiful place, the resort is a perfect place to spend a night with friends or family. 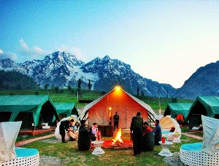 Accommodation The resort renders 10 luxurious tents which are equipped with basic and contemporary amenities to make the guests’ stay comfortable and gratifying. The in-room facilities include telephone, television, room service and attached washroom with hot and cold water supply. Round the clock room service is also available for all those who want to relish food from the comfort of the rooms. Dining The restaurant offers Indian, Ladakhi, Chinese and continental cuisine to satisfy the taste buds of the guests coming from different parts of the world. Tour my India offers you one of the best hotel packages to make your stay extraordinary at Ahsan Mount Resort. Book in advance and relish your stay to the hilt.